Welcome to the monthly Ink & Inspiration Blog Hop. You are currently visiting Joanne Cantrell from the United States. This month is all about sympathy. The projects will feature get well, sorry, and sympathy sentiments. While these cards are not given for fun.. they are always needed and will provide a light in the darkness that someone is treading through. Stampin’ Up offers several stamp sets that contain sentiments perfect for sending to those you love in their time of need. Because I am bit of a strange goose, one of my favorites set is Here for You. I love the cheeky little sentiments! But, today, I went with one you may not think of first and one that literally screams “Sorry”. 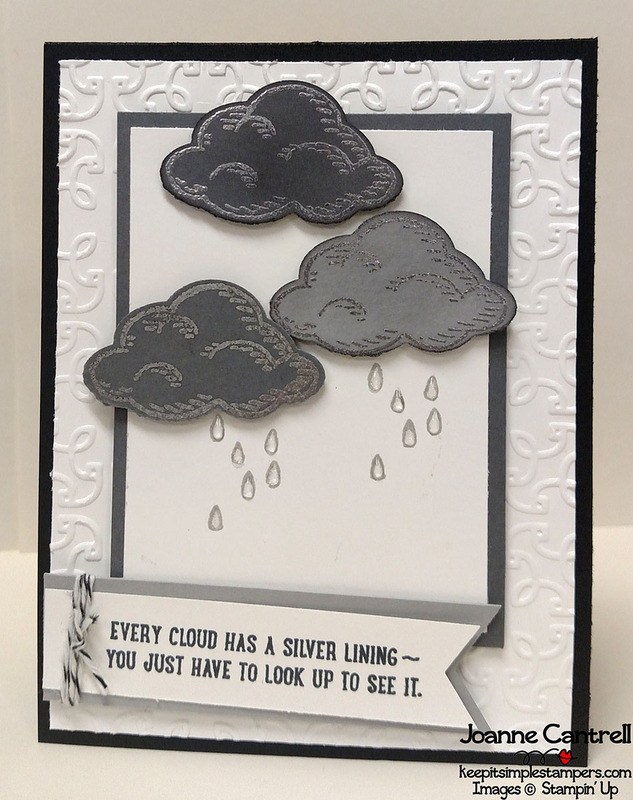 I used the Silver Lining sentiment from the Sprinkles of Life stamp set to set the mood for this card. 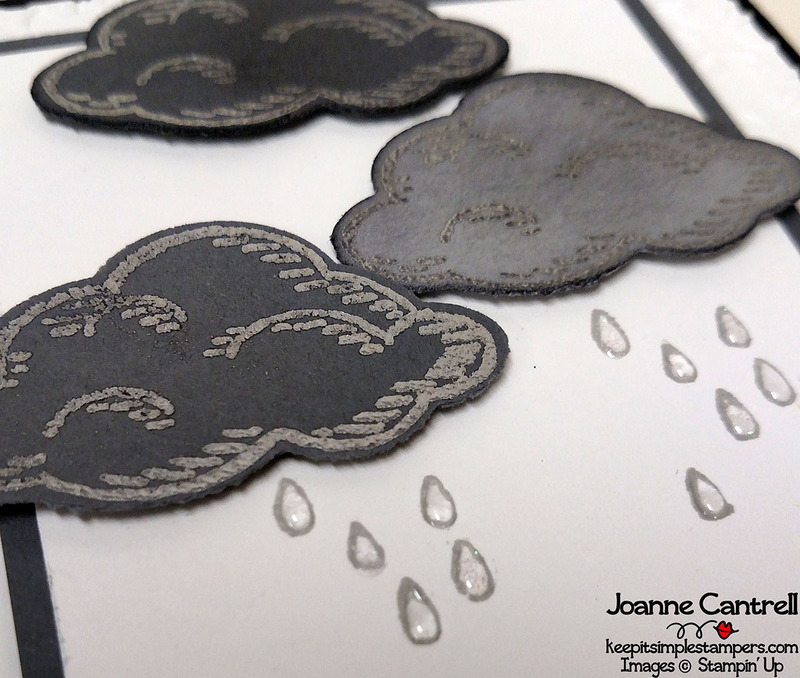 Using the various colors of gray gives it a bit of a sad feeling, but each of the clouds have silver embossed linings! Can you see what else I have added? How about a closer look? Do you see them now? The texture on the rain drops? This card uses the go-to Sorry for Everything stamp set. 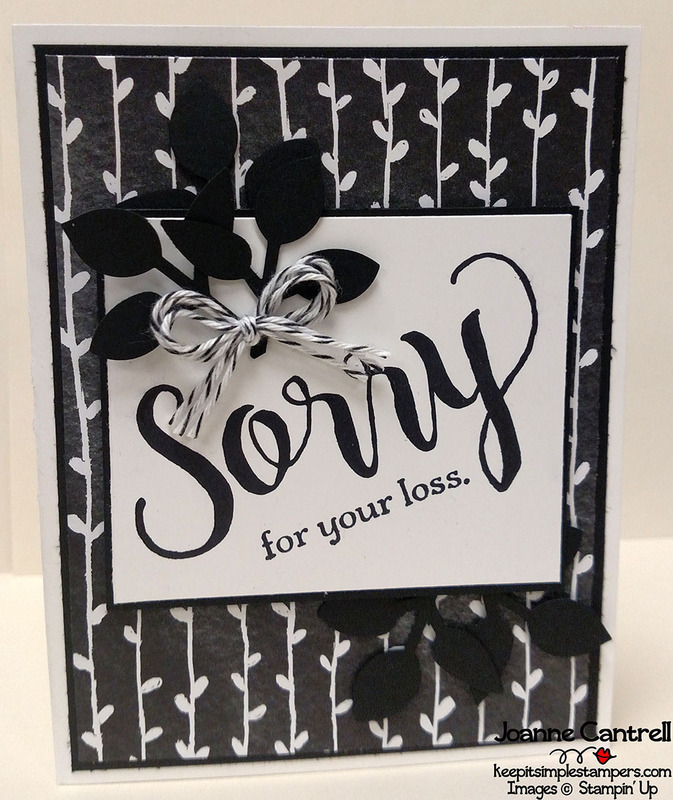 There are so many different combinations of sorry sentiments that can be made with this set. If you don’t already own it, you really need to! This card features a simple black and white color scheme. I added texture with the leaf punch… Sure hope that one carries over! And what about that DSP? Don’t you just love it? It’s another SNEAK PEEK from the 2018 Occasions Catalog! So, if you are wondering how I already have items from the new catalog that hasn’t even been released yet… it is a PERK of being a demonstrator. But, a little more than that… it is the perk of being a demonstrator that went to OnStage, our twice-a-year convention that is always tons of fun! If you have ever thought about being a demonstrator, now if the time to join… You can add new catalog items to your starter kit beginning Dec. 1. Just contact me and I can help you out!!! Oh, before I forget and if you are interested… I have got some project sheets for you! So, here is the list of bloggers… Hop along now! Awww I love this card! Love the new rain drops! I love your card…those little clouds just make me smile. And the raindrops!! Can’t wait to use those!! I love these cards Joanne especially the clouds and rain one, just stunning!